Riebeckite is a sodium-rich member of the amphibole group of silicate minerals, chemical formula Na2(Fe2+3Fe3+2)Si8O22(OH)2. It forms a solid solution series with magnesioriebeckite. It crystallizes in the monoclinic system, usually as long prismatic crystals showing a diamond-shaped cross section, but also in fibrous, bladed, acicular, columnar, and radiating forms. Its Mohs hardness is 5.0–6.0, and its specific gravity is 3.0–3.4. Cleavage is perfect, two directions in the shape of a diamond; fracture is uneven, splintery. It is often translucent to nearly opaque. It was first described in 1888 for an occurrence on Socotra Island, Aden Governorate, Yemen and named for German explorer Emil Riebeck (1853–1885). It typically forms dark-blue elongated to fibrous crystals in highly alkali granites, syenites, rarely in felsic volcanics, granite pegmatites and schist. It occurs in banded iron formations as the asbestiform variety crocidolite (blue asbestos). 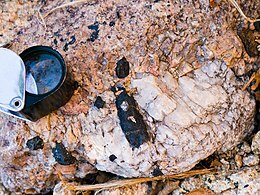 It occurs in association with aegirine, nepheline, albite, arfvedsonite in igneous rocks; with tremolite, ferro-actinolite in metamorphic rocks; and with grunerite, magnetite, hematite, stilpnomelane, ankerite, siderite, calcite, chalcedonic quartz in iron formations. The riebeckite granite known as ailsite, found on the island of Ailsa Craig in western Scotland, is prized for its use in the manufacture of curling stones. Riebeckite granite was used for the facing stones of the Canton Viaduct from Moyles Quarry (a.k.a. Canton Viaduct Quarry) now part of Borderland State Park in Massachusetts, US. The commonwealth's name is even taken from an Algonquian word for the Great Blue Hill, which got its color from this form of granite. The fibrous forms of riebeckite are known as crocidolite and are one of the six recognised types of asbestos. Often referred to as blue asbestos, it is considered the most hazardous. In 1964 Dr Christopher Wagner discovered an association between blue asbestos and mesothelioma. Crocidolite asbestos was mined in South Africa, Bolivia and also at Wittenoom, Western Australia. Bolivian crocidolite was used in Kent Micronite cigarette filters in the 1950s. Blue asbestos was also used in early gas masks. Wikimedia Commons has media related to Riebeckite. Chisholm, Hugh, ed. (1911). "Crocidolite" . Encyclopædia Britannica. 7 (11th ed.). Cambridge University Press. p. 477.